On Facebook’s 14th birthday let’s mark the event by reminding ourselves how to use the social media giant to boost your business. We’ll also take a look at how recent algorithm changes impact the timeline and how you can stay visible. category from the 6 below. These categories have further sub categories which describe what you actually do. 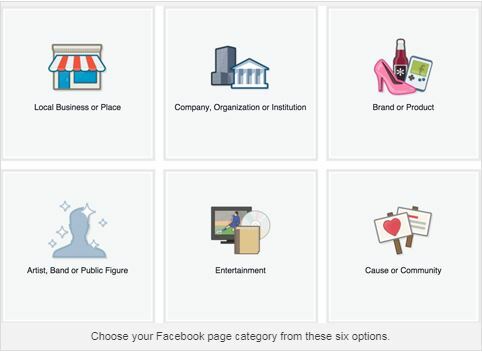 Facebook suggests that you can change the main page category at any time. However while it is true that you can change the sub –categories you’re stuck with the main category (although you can always create a new page with a new category), so choose well. For the vast majority of SMEs the most appropriate choice will be ‘Local Business or Place’. This option gives you the most features, including the opportunity to show your business on a map, and to allow ratings and reviews. The benefit of potential customers knowing where your business is located are clear if you have a ‘bricks and mortar’ business that customers visit in person, but even if you work remotely or in customers’ homes they will appreciate the security of knowing where you exist in the ‘real world’. Fill in as many of the fields as you can. Make sure you keep your NAP details (name, address, telephone number) consistent with what appears across the internet, and of course your own website. This will ensure consistency in local citations which will in turn help improve your visibility in local search rankings. Opening hours for bricks and mortar buildings are pretty straightforward. If you don’t have an office or shop, use these to indicate when you are ‘open for business’ in the broadest sense. If you’re willing to take phone calls from 8am, then make that your opening time. The beauty of social media is its immediacy and flexibility. So if any of your details change make sure you change your Facebook details to bring them in line. We’ve seen companies that have failed to change email addresses or update phone numbers that have changed. Not a great way to encourage prospective customers to get in touch. Make sure you set up auto reply on your messenger. It helps to give potential customers an idea of your response time. If you’d like to direct them to an online booking option or a mobile number, you can do this here too. Whatever you decide make sure you get back to them reasonably quickly. In January 2018 Mark Zuckerberg announced changes to the Facebook algorithm. Zuckerberg indicated that what he was hoping to achieve with these changes was more ‘meaningful interactions’. They will prioritise content from friends, family and groups, with the knock-on effect of reducing the visibility of content from pages, including business pages. However he also hinted at how businesses could still maintain their reach on the platform. Businesses should start to be more proactive in replicating the type of ‘natural’ interaction we engage in with friends and family on Facebook. This means posts that encourage comments such as ‘what do you think?’, ‘how would you improve this?’ etc. These can also act as a handy piece of informal market research. Even something like a caption competition can broaden your reach. Remember, when people comment their friends and family often see this activity; raising your profile. Facebook users will still see some content from the pages they have liked. So make sure you encourage them to like you. Simple measures like providing direct links to your profile in your email signature or publicising ‘Facebook only’ offers can encourage customers to like your page. You should be doing this anyway. Posts on your business page should fit into your wider marketing strategy, and be designed to keep your followers interested in what you are up to by being relevant to them. With a few tweaks you can start to create the types of posts that will encourage deeper engagement. For example if your restaurant is launching a new menu, rather than just posting a link to it with your announcement, why not ask followers for feedback? Questions such as “What are you looking forward to tasting” will get them commenting. And when your followers comment their friends will see that they’ve commented, building the organic reach of your post. If you run physical events, from quiz nights to in-store sales, then make sure that you create them as events on Facebook. Not only will this give you the opportunity to provide more information, but as people mark themselves as ‘going’ or ‘interested’ this will again be visible to their friends. You’ll also show up when people search for ‘events near me’. Facebook works best when you create a two-way conversation with followers. Take time to respond to customer comments, even if it’s just ‘liking’ them or a quick ‘thanks’. If customers have used your page to complain about your business, acknowledge the complaint (to show you’ve taken it seriously) but take it off-line as soon as possible by asking them to call you or PM you their number so you can call them back. Your website’s content should be regularly updated as a matter of course, for example with regular blog posts showcasing your particular expertise. You can use your Facebook page to tease this content and drive traffic to your site. But don’t forget the guidance about engaging followers. Maybe get them to feedback on your articles. Do You Need To Do it All Yourself? Remember, building a successful Facebook audience is about engagement. Will you have the time or inclination to update it and respond, or is there someone in your business that is more engaged with Facebook than you are? Maybe someone, dare we say, a little younger? Business is about using all your resources well, so if you’ve got someone who’s much more confident about social media let them manage your Facebook page. As long as they have clear guidelines about what they can and can’t post you shouldn’t run into any problems, and you may find that this is a quick and easy way to build engagement. So far we’ve focused on organic reach, i.e. things you don’t have to pay for you. If you want to build your audience on Facebook though it may be worth considering paid advertising. Facebook ads can be very effective as they can be very effectively targeted. Targeting can be done on criteria such as age, gender or geographical location, or even based upon what other Facebook content users have liked. You can also build custom audiences based on your own marketing lists. However, building effective paid campaigns can be overwhelming and could end up eating into your budget without much real return. That’s why we’d recommend asking a digital marketing expert to manage these for you. Take a look at Insite Web’s Pay-per-click and digital marketing services and find out how we can help build your business.